EUCHRONIA final lineup, artists & DJs announced + XMAS SPECIAL! Are you still ummming and ahhing about NYE? 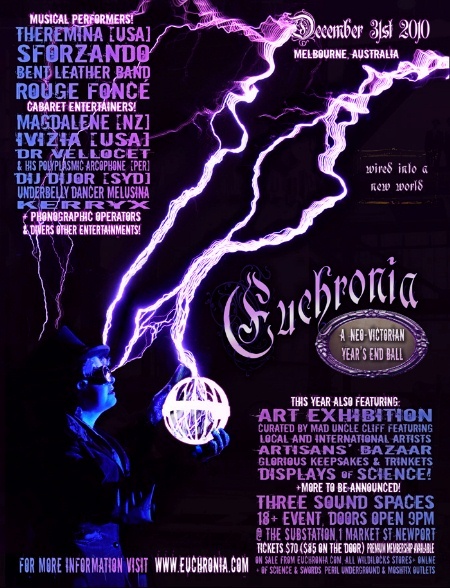 Need a few more reasons to be convinced that Euchronia this year will utterly eclipse 2008's hugely successful event, and you'd be completely mad to miss it? We can also now reveal our MASTER of CEREMONIES to be none other than the inimitable TIM HARRIS, who appeared with The Tenth Stage at Euchronia 2008; Tim's mastery of wit and style is bound to impress. Finally, we're excited to announce the last minute addition of STEPHANIE (CAN) to our performers' bill: a delightful dancer sure to bewitch and enchant. We're also thrilled to reveal the full complement of artists for the Euchronia exhibition hall: click through for details about each exhibitor: all will have magnificent pieces on show! Many, many of you have already purchased your tickets (and we're particularly overwhelmed by number of interstate visitors this year! ), but if you still haven't gotten around to it, or if you're looking for a perfect last-minute gift idea, we're offering a little incentive to buy earlier rather than later. Euchronia's XMAS SPECIAL: if you buy before 25 December you can receive 2 tickets for only $125, a discount of $15 off current prices (and $45 less than you'll be charged on the door)! In addition, ALTV memberships are still available ALL the way up to NYE, providing tickets at the presale price PLUS 4 free standard drinks, entry to the member's lounge (now with FREE TEA and COFFEE ALL NIGHT LONG!) and membership package, all for the modest sum of $85 per combined ticket. Bargain! Please note that we are expecting the event to reach capacity, so don't leave your decision too late. Remember, any tickets remaining for sale on the door will be $85 each, and ALTV members will be given preference.